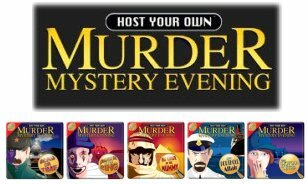 Mystery Game Central now lists a full selection of Host Your Own Murder Mystery Evening games. Each title is a complete night’s entertainment in one box, including invitations, a host instruction booklet, character booklets, name tags, and even themed recipes. An “investigator” narrates the story on a special CD, which directs the play and helps set the mood for a unique dinner party experience. All you need to add are friends and food. All of the games provide great opportunities for you and your guests to dress-up, get into character, and really ‘ham-it-up’ as you try to figure out who-dun-it! The Murder Mystery Evening games are published by Cheatwell Games, which produces an innovative and entertaining collection of games, gadgets and puzzles, In addition to the mystery titles, Cheatwell also offers ethnic-themed dinner party games (“Host Your Own Mexican Evening” and “Host Your Own Italian Evening”), nostalgia-themed dinner party games (60’s, 70’s, and 80’s Nights), and many other types of party games. I have lost the instructions and the cassette!!!!!!!!! Can you help me by allowing me to downbload the cassette to my PC so I can burn it? I will pay for these requests.